I swear that cookie eerily looks like Steven Tyler. Everybody has secrets. You know you’re guilty when you can’t even tell your closest ally. Whether it’s an act or even just a thought that you’re fully aware isn’t quite right and still you act upon it, it’s sin. Blame it on our Roman Catholic roots, but everybody has an inkling of what is good or not. Back in university, there were times that the bleak English weather made me a little homesick. I came across a little shop that sold American snacks and it instantly made me feel very nostalgic because it was a reminder of my parents making snack packs to bring to school. I picked out a one pound bag of Oreos and on the way back home I also grabbed a liter of full cream milk. I locked myself up in my room and consumed all the milk and cookies in one sitting. What was wrong with me? Why wasn’t I sharing my loot? Having all that for dinner would make me sick because Oreos has no place in the food pyramid. It felt so sinful yet there was a sense of comfort as well. Mini Oreos = Cereal. Nice. 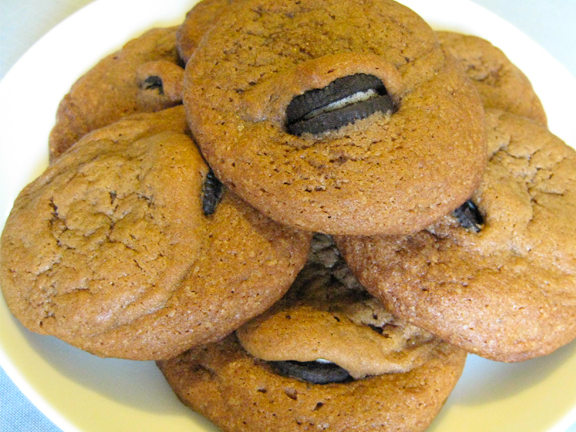 Since then, I never bought Oreos…Until recently when I found a recipe online called “Oreo Stuffed Chocolate Chip Cookies” and decided to give it a chance. To lessen the guilt, I purchased the Mini Oreos (giving the illusion that smaller is the lesser evil) and made two variations of the cookies: I followed the recipe online and the other I just placed the Oreo on top of the cookie dough. Another illusion to take into consideration here is that they’re baked goods versus fried food. Whatever. The verdict? The Oreo came out a little soft when it first came out of the oven. The regular or Double Stuf would’ve been perfect. 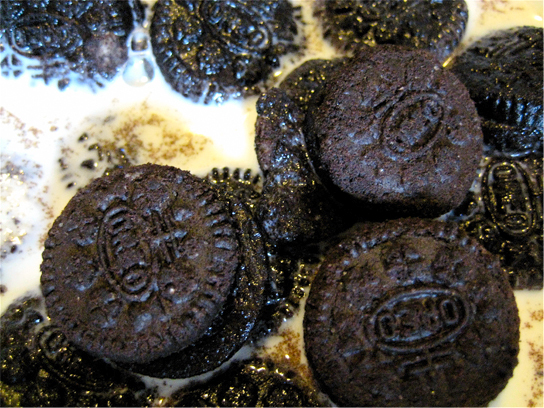 I gave out cookies to some willing testers and they enjoyed it very much.I personally prefer having the Oreos on its own so this is how I had them for breakfast: Mini Oreos swimming in a bowl of milk. I still have a bag and a half of Mini Oreos in the kitchen and already I hear them calling out my name again.